A family farm is generally understood to be a farm owned and/or operated by a family; it is sometimes considered to be an estate passed down by inheritance. Family farm businesses can take many forms, as most farm families have structured their farm businesses as corporations, limited liability corporations, and trusts, for liability, tax, and business purposes. It is a common misconception that all farms with these business structures are not family farms, when in actuality that is not true. In the United States for example, a 2014 USDA report shows that family farms operate 90 percent of the nation’s farmland, and account for 85 percent of the country’s agricultural production value. Lytton is a city in Sac County and has grown into Calhoun County in the U.S. state of Iowa. The population was 315 at the 2010 census. Louis A. Lavorato is a former Justice of the Iowa Supreme Court from February 12, 1986, appointed from Polk County, Iowa. Melanoma, also known as malignant melanoma, is a type of cancer that develops from the pigment-containing cells known as melanocytes. Melanomas typically occur in the skin, but may rarely occur in the mouth, intestines, or eye. In women, they most commonly occur on the legs, while in men they are most common on the back. Sometimes they develop from a mole with changes such as an increase in size, irregular edges, change in color, itchiness, or skin breakdown. Mark D. Martin was the Chief Justice of the Supreme Court of North Carolina from 2014 through 2019. He was appointed by North Carolina Governor Pat McCrory to become Chief Justice on September 1, 2014 upon the retirement of Sarah Parker. Martin was already running for the seat in the 2014 general election. The Supreme Court of Iowa is the highest court in the U.S. state of Iowa. As constitutional head of the Iowa Judicial Branch, the Court is composed of a Chief Justice and six Associate Justices. Nathan Lincoln Hecht is the Chief Justice of the Supreme Court of Texas. A Republican from Dallas, Hecht was first elected to the Supreme Court in 1988 and was reelected to six-year terms in 1994, 2000 and 2006. He secured his fifth six-year term on November 6, 2012. He was appointed chief justice by Governor Rick Perry on September 10, 2013, and was sworn into that position by retiring Chief Justice Wallace B. Jefferson on October 1, 2013. The Chief Justice of New Zealand is the head of the New Zealand judiciary, and presides over the Supreme Court of New Zealand. The Chief Justice of New Zealand is also the Chief Justice of Tokelau. Before the establishment of the Supreme Court in 2004 the Chief Justice was the presiding judge in the High Court of New Zealand, and was also ex officio a member of the Court of Appeal of New Zealand. The office is established by the Judicature Act 1908. The Supreme Court of Louisiana is the highest court and court of last resort in the U.S. state of Louisiana. The modern Supreme Court, composed of seven justices, meets in the French Quarter of New Orleans. The United States District Court for the Southern District of Iowa has jurisdiction over forty-seven of Iowa's ninety-nine counties. It is subject to the Eighth Circuit Court of Appeals. Cheri L. Beasley is an American judge currently serving as the Chief Justice of the North Carolina Supreme Court. Beasley had previously served on the North Carolina Court of Appeals and as a District Court Judge in Cumberland County, North Carolina. The Iowa Court of Appeals is the intermediate-level appellate court of the state of Iowa. Its purpose is to review appeals from trial court decisions which are referred to the court by the Iowa Supreme Court. The court decides the vast majority of appeals filed from trial courts in the state of Iowa, and its decisions are final unless further review is granted by the Iowa Supreme Court. Christopher Dietzen was an associate justice of the Minnesota Supreme Court from 2008 to 2016 and a judge of the Minnesota Court of Appeals from 2004 to 2008. Brent R. Appel is a Justice of the Iowa Supreme Court, nominated by Iowa Governor Tom Vilsack for a term starting in 2006 to succeed James H. Carter on the Court. 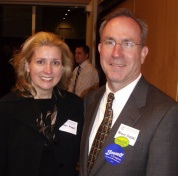 His wife, Staci Appel, is a former member of the Iowa Senate from the 37th district. He has six children, five sons and one daughter. Appel graduated from Stanford University with concurrent A.B. and A.M. degrees in 1973. He earned his J.D. at the University of California, Berkeley School of Law in 1977. In 2010, Chief Justice John Roberts appointed Justice Appel to a six-year term as a member of the federal Advisory Committee on the Rules of Evidence. Lisa S. Neubauer is an American jurist and the chief judge of the Wisconsin Court of Appeals. Neubauer has served on the Court of Appeals since 2007 and as chief judge since 2015. Neubauer was a candidate for the Wisconsin Supreme Court in the April 2019 election to succeed retiring Justice Shirley Abrahamson. Edward M. Mansfield is a Justice of the Iowa Supreme Court. Mansfield graduated from Harvard College in 1978 and Yale Law School in 1982. After law school Mansfield clerked for Judge Patrick Higginbotham of the United States Court of Appeals for the Fifth Circuit before entering private practice. In 1997, Mansfield started teaching as an adjunct professor at Drake University and has served as the chairperson of the board of directors of Goodwill Industries of Central Iowa. Mansfield joined the Iowa Court of Appeals in 2009. David Wiggins is a justice of the Iowa Supreme Court. The judiciary of Iowa is a branch of the Government of Iowa that interprets and applies the laws of Iowa, to ensure equal justice under law, and to provide a mechanism for dispute resolution. Article V of the Constitution of the State of Iowa defines the judiciary as comprising a Supreme Court, district courts, and any inferior courts established by the General Assembly. Bruce B. Zager is a former justice of the Iowa Supreme Court. Born and raised in Waterloo, Iowa, Zager graduated from the University of Iowa in 1975 and from Drake University Law School in 1980. He was appointed to the Iowa District Courts in 1999. David L. Baker was a Justice of the Iowa Supreme Court from 2008 to December 31, 2010. James H. Carter was a Justice of the Iowa Supreme Court from August 14, 1982 until his retirement on October 16, 2006. Carter lived in Cedar Rapids, appointed from Linn County, Iowa. He died on February 27, 2016. Susan Kay Christensen is an Associate Justice of the Supreme Court of Iowa. Christopher McDonald is an Associate Justice of the Supreme Court of Iowa. 1 2 3 Iowa Judicial Branch page for Daryl L. Hecht, accessed September 18, 2017. 1 2 3 4 Hayworth, Bret (August 2, 2006). "Hecht appointed to Iowa Supreme Court". Sioux City Journal . ↑ "Vilsack Names New Iowa Supreme Court Justice". The Courier . August 2, 2006. ↑ "Iowa Supreme Court Retain Daryl Hecht Results: "Yes" Wins". The New York Times . August 1, 2017. ↑ Gruber-Miller, Stephen (November 16, 2018). "Iowa Supreme Court justice with cancer will resign in December". Des Moines Register . ↑ Sostaric, Katarina (February 20, 2019). "Reynolds Appoints Appeals Court Judge Christopher McDonald To Iowa Supreme Court". Iowa Public Radio . ↑ "Former Iowa Supreme Court Justice ﻿Daryl Hecht has died". KCCI Des Moines. Retrieved 3 April 2019.